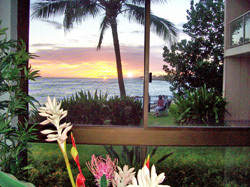 Our oceanfront Kauai condo at Kuhio Shores offers Poipu vacationers the best close up ocean views found on Kauai. 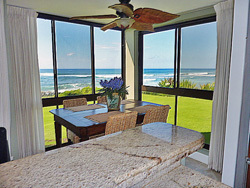 Featuring floor to ceiling windows across the entire ocean view side of the condo, our Poipu rental condo allows Kauai vacationers to watch the sunsets, whales, sea turtles, spinner dolphins, and the best surfing action in all of Kauai, while they're sitting down in the condo. The sounds of the ocean are in every room! Quality is in every room too! Our Kuhio Shores condo has a fully equipped kitchen furnished with solid oak cabinets, built-in $7,000 Sub Zero refrigerator, brand new top of the line Kitchen Aid Stainless Steel appliances, including a convection oven. White kashmere granite slab counter tops round out the kitchen decor. The kitchen has a great ocean view. If you're not in the mood for cooking, one of the best restaurants on Kauai, The Beach House, is just a few steps from Kuhio Shores. Many other great restaurants are less than a three minute drive. Kuhio Shores has several barbecue's located on the grounds. The living room has brand new Hawaiian style rattan furniture with subdued tropical print fabric. Our condo at Kuhio Shores also has brand new tile flooring, new carpets, new art work, new ceiling fans, new track lighting, and a new 32 inch flat panel high definition plasma television. Also included are complete stereo systems, DVD/CD players, and free high speed Internet. 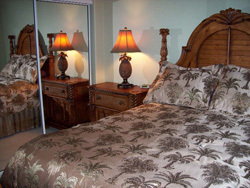 Each bedroom has brand new Tommy Bahama king & queen pillow top beds. Matching Tommy Bahama night stands and dressers are also part of the decor. Glass block was used as a decorating touch in each room. Brand new window shutters are on each bedroom window. If you plan to surf, snorkel, boogie board, or scuba dive during your Kauai vacation, Kuhio Shores is the perfect spot. 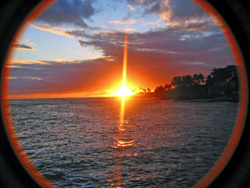 The best snorkeling, scuba diving, boogie boarding, and surfing on the South Shore of Kauai is right out the back door. 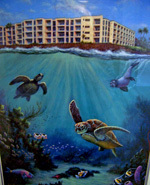 Scuba diving is just a few yards off to the left of the condo. All water sports can be seen as you sit in our Poipu condo. 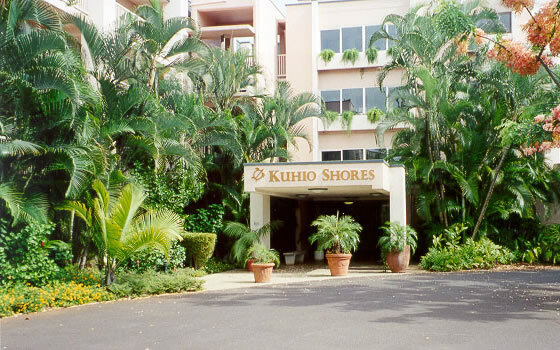 Professionally decorated and maintained, our Kuhio Shores condominium offers some of the highest quality accommodations and lodging found anywhere on Kauai. 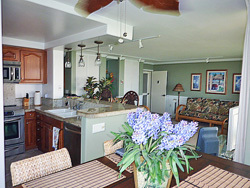 No expense was spared to make our vacation rental at Kuhio Shores, as beautiful and comfortable as possible for those planning to spend their Kauai vacation in Poipu Beach.